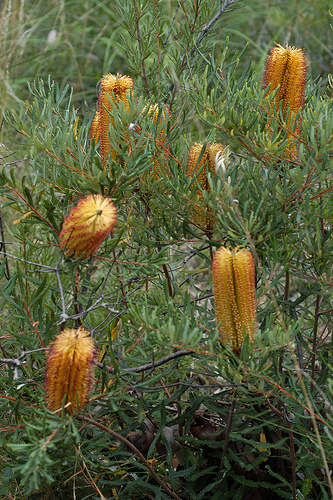 Formerly known as the Prickly-leaved Banksia, the Hairpin Banksia is a woody shrub that belongs to the genus Banksia. 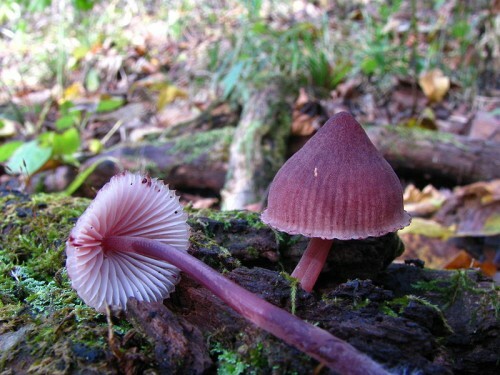 It is native to eastern Australia, from Queensland to Victoria. It was first scientifically described in 1793 by Englishman, James Edward Smith through a collection that was collected by John White a year earlier. There are currently 4 recognised varieties and many cultivars, and this species has had a complicated taxonomic history. There are still currently disagreements on taxonomy of Hairpin Banksia sub-species as well. The Hairpin Banksia is a multi-stemmed lignotuberous shrub that grows up to 3 metres tall and up to 2 metres wide. 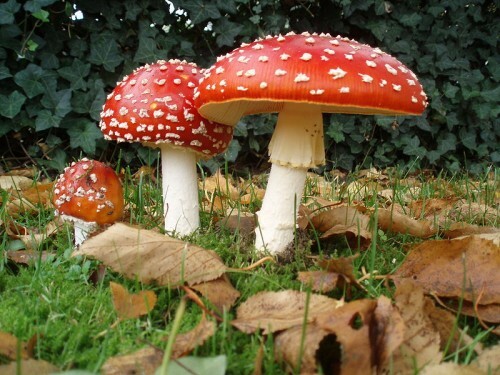 However, it can be single stemmed and lack a lignotuber and grow up to 5 metres tall. It has grey or grey-brown smooth bark. 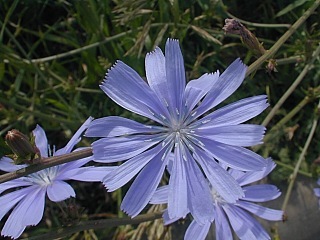 Its leaves are narrow at 3 to 10 cm long, and 1 to 8 mm wide. Leaf edges are serrate, but its margins can be recurved and serrations are not evident from those from the Carnarvon Gorge. As with other Banksias, the inflorescences are where flowers are densely packed onto a woody axis. Flowers can vary in colour, from golden orange, yellow, black, maroon, or even pink. 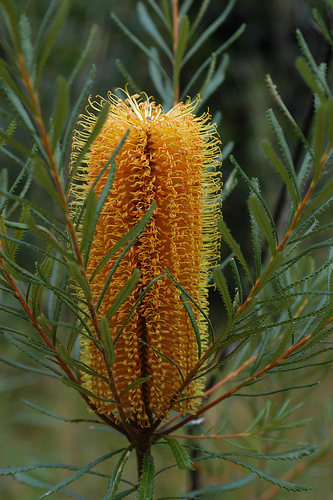 Common areas that the Hairpin Banksia is found include Catherine Hill Bay and the Georges River National Park. The Hairpin Banksia is pollinated and provides food for a wide variety of invertebrate and vertebrate animals during the colder months. Its floral display and fine foliage make it a popular garden plant and there are many horticultural selections available as there are many cultivars. As there is a trend towards having smaller gardens, dwarf forms of the Hairpin Banksia have become popular. The first even dwarf form available was ‘Birthy Candles’ which was very commercially successful.